Dangly plugs are great, but wouldn't it be nice if you could take the dangles off and pop them on your favourite single-flared or screwback plugs? Well, we've made this possible with Plug Pendants. Simply get your plug or tunnel, slide on the Plug Pendant and put in your ear -- it's as simple as that. 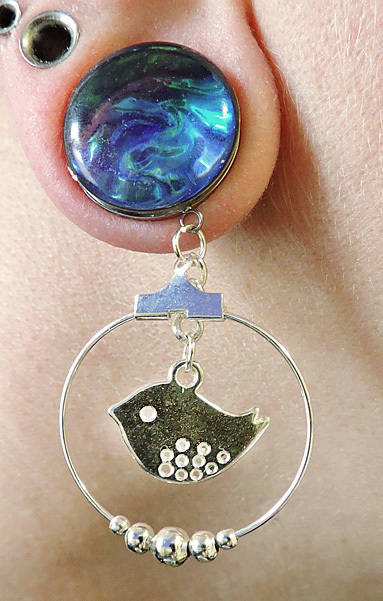 See top right for a picture of the Bird in Hoop Plug Pendants worn with an Aurora Borealis Blue plug. Plug Pendants have a 316L surgical steel base, so they won't make your ear go funny, and have low-nickel dangly components. You can get them in sizes 8mm / 0g - 20mm / >3/4" and they'll happily fit on most single-flared and screwback plugs (we've tested them on a lot of different plugs with no problems, but can't absolutely, positively guarantee they'll fit on your plugs as some plugs may run a bit big). 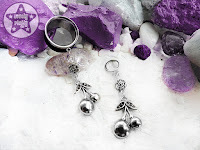 You can find Plug Pendants in the Dangly department at Lovely Plugly, or you can get them from the Lovely Plugly Etsy Shop. Birthday, yay! Plugs, yay! Coupon code, yay!